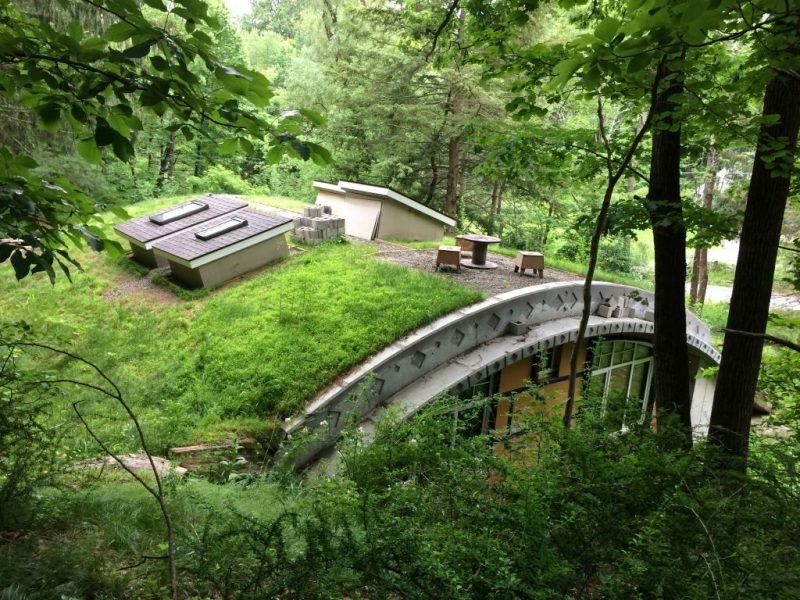 Hobbit Houses Have Round Hallways!….. Happy Father’s Day! Welcome friends of old! The continuing story of building a Hobbit house is about to continue. Glad you stopped by for this short tale. Computers. Ya can’t live with them and you can’t live without them it seems. I plugged in my I-Phone this morning to try and download my pictures from the past two weeks and wah la! Everything worked like a charm. I guess last week my computer was just in a bad mood or something. Maybe it was just pissed off about the weather as of late. That seems to be getting to everyone. Happy Father’s Day by the way to all you fathers out there. I hope you enjoy a little R and R. My daughter Georgia sent me this tower of goodies in the mail. I almost finished it in one sitting. It was pretty good. The boys are making me a salmon dinner on the grill. String beans and red potatoes on the side. Smothered in butter of course. Mmmmm. I can’t wait. The only downside is that battle-ax of a mother-in-law is stopping by to have dinner with us. I mean let’s be honest. What do you say to your wife when she asks if her mother can come over for dinner? Especially when she has those big sad pleading eyes on. I don’t mind it though really. But there’s no way on god’s green earth she’s walking out of here with any left overs. No way. And I know what the Editor’s going to say, “It’s really not enough for all of us.” Well it’s gonna be enough for me. Trust me on that one. So I finished up the skylights Saturday morning. Check it out. I just have to paint the trim. A minor detail. The patio up top is nice. Real nice. Hobbits love to have tea outside. Especially on their roofs. I’ll have to get some stone up there and finish that off as well. The well guy didn’t show up this weekend though Had a death in the family unfortunately. Hopefully next weekend. I did however prep the room where the water tank is going to go. The mechanical room is interesting. I had a general idea of where everything should go but the last well guy threw me for a loop. I’m not supposed to have any water mechanicals within three feet of the electrical panel box. I originally thought that it would go right next to the panel box so that got scratched. 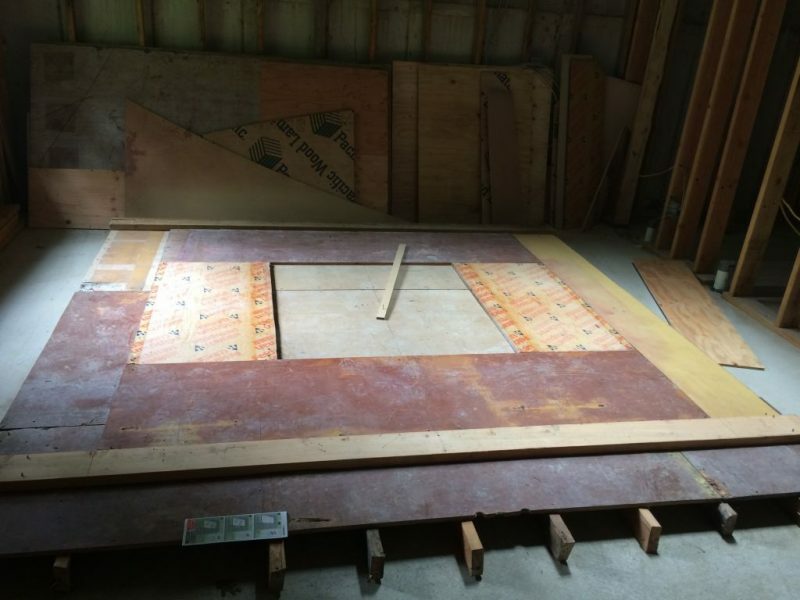 I also decided to put up the drywall on the wall where the water tank would be against.. So I picked up some MR boards at the hardware store.Yeah. That’s right MR boards. Wake up and smell the coffee will ya. Moisture resistant boards people. Remember? This is a mechanical room people pay attention. I saved a roofing template from way back when because I knew this day would come. I used it to get the curvature of the ceiling right on the drywall. Check it out. 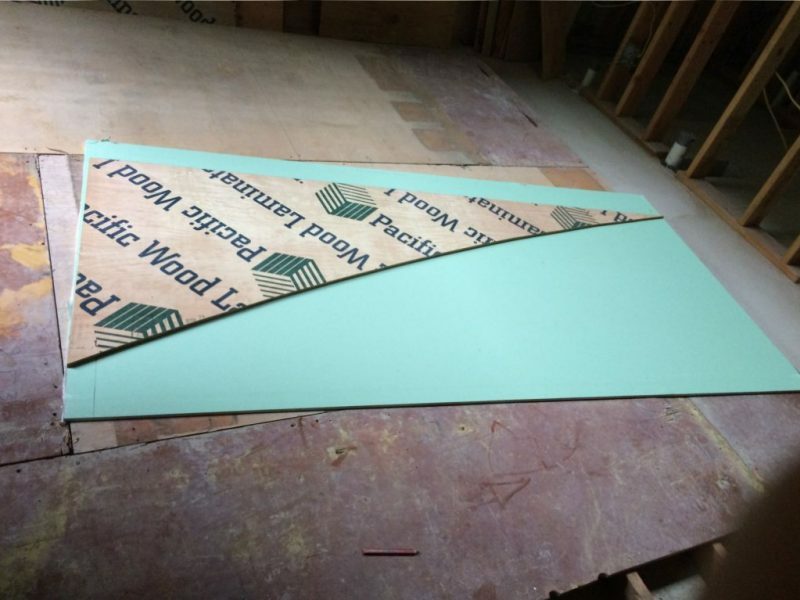 Roof curvature transferred to the drywall using this template I had saved. It’s not a perfect fit but it’s close enough. That’s why you tape drywall. Let me show you what I put up. 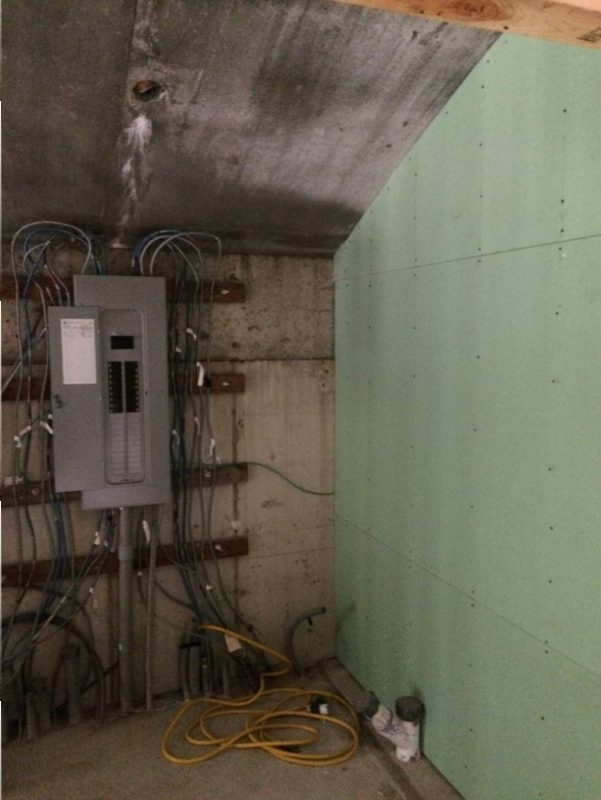 Drywall up on one wall of the mechanical room. So once I finished that I set my sights on the hallway framing. Now for all you none Lord of the Rings people out there there is one thing you have to know about Hobbit houses. And that one thing is is that Hobbits have round hallways or tunnels connecting the various rooms of their homes. Which for some reason I woke up in the middle of the night and started obsessing about. Like how do you frame it? Which I sort of knew how I was going to frame it but the devil is always in the details and sometimes when you really start to get into it somehow you forget about this or that part of what needs to happen. So I had to do some sketching and drawing to figure out how I was going to do this because I’ve never framed a circular hallway before. They actually take up a lot of space. One of the other key elements that I considered was the height of the hallway. I used 6 foot 8 inches as my standard height. I also wanted to maintain that minimum across a 36 inch width of hallway. You know so tall people don’t bump their heads. So figuring all that out and laying it out on my layout board took quite a while. And got me fairly tired. I’m all set to rock and roll next time though. Check out what I set up. Layout board for the hallway template. I’ll show you some of the other minor details once I get going. It’s going to be a lot of fun putting this together. I really can’t wait. Take care and I’ll see you next week! PS: I did get that last piece of salmon! HaHa! Of Circular Hallways………….Terence Graduates High School! !